“As you know, the Catholic Church was rather a latecomer to the restoration of Christian unity.” With these words, Archbishop Michael Miller, CSB, leader of the Roman Catholic Archdiocese of Vancouver, welcomed an ecumenical audience – predominantly Catholic, but with a good number of representatives from other parts of the church – to a January 17 symposium on Christian Unity: Have We Answered the Call? The event was hosted by St. Francis Xavier Catholic Church on Great Northern Way just east of Main Street and helped to mark the Week of Prayer for Christian Unity (January 18 – 25). Fr. Thomas Rosica set a positive tone for a day of discussion about ecumenism. The ecumenical movement, born in the 20th century is the means by which the churches which form the house ‘oikos’ of God, seek to live and witness before all peoples the wonders God has worked among us, especially through the crucified and risen Christ and his life-giving Spirit. We cannot forget the historical background of that century, which began with a belief in progress and turned out to be one of the darkest and bloodiest centuries in the history of humankind, with two world wars, many local wars, civil wars and ethnic conflicts, two humanity-despising totalitarian systems, concentration camps and gulags, genocides, expulsions and waves of refugees. Never before had so many people violently lost their lives in one single century. But out of the utter despair of those years, a bright light shattered the darkness: the ecumenical movement. After centuries of Christian fragmentation, a counter movement quietly began as churches became painfully aware that such a situation contradicted Jesus Christ’s will, and was a sin and a scandal. The separation of the churches – 1,500 years ago with the Ancient Oriental Churches, 1,000 years ago with the Orthodox Churches and almost 500 years ago with Reformed Christianity, with a tendency to still new divisions – had seriously prejudiced the credibility of the Christian message. Nor can we forget that this new ecumenical awareness developed in connection with the missionary movement. The birth of the ecumenical movement finds its roots in the 1910 World Missionary Conference of Edinburgh. The division of the churches was recognized as a serious obstacle to world mission. A second impulse came from the war experiences and the national socialist terror. In the concentration camps, courageous Christians from different churches discovered that in their resistance against a new pagan totalitarian reign of evil, they had much more in common than what divided them. Thus, the ecumenical movement emerged fully in the second half of the 20th century. The founding of the World Council of Churches in 1948 in Amsterdam was an important milestone on the ecumenical way. Fifty-six years ago January 25, St. John XXIII announced an ecumenical council that would bring together the bishops of the Catholic Church as the Church’s most important deliberative body. In a series of meetings from 1962 to 1965 later to be known as the Second Vatican Council – the bishops of the world sought to update and renew the life of the Catholic Church. A second, related goal of the Council was “the restoration of unity among all Christians.” We must never forget that one of the two goals of the Council was Christian unity: ecumenism. . . . This past November 21 marked the 50th anniversary of the promulgation of the Second Vatican Council’s Decree on Ecumenism: Unitatis Redintegratio. The Council Fathers approved almost unanimously the Decree: 2,137 voted in favour, only 11 against. . . . The Decree on Ecumenism received an overwhelming majority vote despite having previously been the object of many heated and considerable debates. In view of the strong language of previous centuries against schism and heresy, it is not surprising that the decree was hotly debated, with many unwilling to break radically from the traditional language. In the end, however, the decree showed much generosity. It accepts that Catholics must take their share of blame for the divisions among Christians and that the living cannot be blamed for the sins of their ancestors. Other Christians are spoken of as “brothers and sisters,” and the unity that already exists is emphasized. The decree recognizes however, that obstacles remain to full communion and it urges Catholics to do their best to overcome them. . . .
Over the past 50 years, ecumenism and the ecumenical movement have become commonplace for most Christians. While ecumenism hasn’t yet achieved full reunion, it’s still among the most visible, powerful, successful Christian movements of the late 20th century. Representatives of evangelical, Orthodox and Anglican communities responded to Rosica. 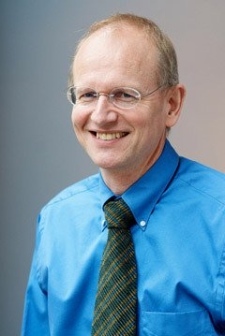 Hans Boersma responded to Fr. Rosica from an evangelical perspective. I am grateful for the passion with which he has spoken about the unity of the church – the same passion, I would think, that lies behind the Vatican Council’s Decree on Ecumenism: “Christ the Lord founded one Church and one Church only,” it emphatically and rightly insists at the very outset (UR 1). I remain somewhat nervous about the way Unitatis Redintegratio appears to suggest that the fullness of unity is already present, in the Catholic Church. For all its outreach to ‘separated brethren,’ the Council nonetheless maintains that it is “through Christ’s Catholic Church alone . . . that the fullness of the means of salvation can be obtained,” and “into which all those should be fully incorporated who belong in any way to the people of God” (UR 3). Through ecumenical dialogue, the Decree maintains that “all Christians will be gathered . . . into the unity of the one and only Church,” which “subsists in the Catholic Church” (UR 4). 3. Boersma’s third point had to do with “retrieving the tradition – ressourcement as theologians often call it,” and about which he has written in great depth in Nouvelle Théologie and Sacramental Ontology: A Return to Mystery and the more accessible Heavenly Participation: The Weaving of a Sacramental Tapestry. What was at stake for [ressourcement] theologians . . . was faithfulness to the Great Tradition of the Church – not just a reiteration of more recent neo-­scholastic articulations of the faith, but also, and especially, a return to patristic and medieval modes of doing theology. Retrieval was necessary, according to these theologians, because the church had become forgetful – forgetful, that is, of her own heritage – of the biblical, patristic and liturgical heritage of the church. In an important sense, then, we should characterize the Second Vatican Council as a deeply conservative council. This is a council that turned to the past, that looked to the riches of the resources of the past, in order to breathe new life into a church situated in the modern world. Retrieval seems to me deeply necessary, again today – both for Catholics and for Protestants. There are all sorts of reasons for this, but in the time that I have left, I will focus on just two: catechetical and liturgical. . . .
Fr. Rosica already observed, rightly I think: “Many do not know what Catholic or Protestant doctrine is all about and what the differences are.” My students at Regent College are remarkably ecumenical. I think that is true of younger evangelicals generally speaking. I do not have a good eye for the situation in the Catholic Church, but my hunch is that it isn’t much different there. Formal ecumenical dialogue may not be progressing the way we would like it to, but today’s spiritual openness among evangelical young people toward Catholics is unprecedented in history; and I suspect this openness mostly runs both ways. I am not quite sure to what extent we should be grateful for this development, and I’m not sure to what extent it is a real answer to the call of Unitatis Redintegratio. The reason for my hesitation is the catechetical and liturgical forgetfulness that has come to dominate many of our churches. When we fail to explain to the next generation the differences between transubstantiation, consubstantiation and spiritual presence it shouldn’t surprise us that we find the next generation frustrated at seemingly arcane ecumenical discussions, discussions that seem like so much scholastic nitpicking to those who haven’t been taught some the basic elements of the Christian faith. The dismal state of catechetical instruction, in many Protestant churches at least, in the end makes ecumenical dialogue an otiose endeavour of theologians whose teaching will seem increasingly abstruse to the faithful in the pews. Fr. 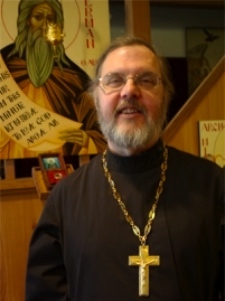 Lawrence Farley brought an Orthodox viewpoint to the discussion. I often think that the best ecumenism is done in the catacombs. That is, as the world around us grows ever darker, ever more secular, and ever more hostile to the historic and traditional Christian faith, we can discover more easily what it is that unites us and makes us different from the world. After all, when the world marginalizes, mocks or even persecutes Christians, it doesn’t much care whether or not they are Orthodox, Roman Catholic or Protestant. Everybody also knows with what love the Eastern Christians enact the sacred liturgy, especially the celebration of the Eucharist . . . in this liturgical worship, the Christians of the East pay high tribute, in very beautiful hymns, to Mary ever Virgin . . . Although these Churches are separated from us, they possess true sacraments, above all – by apostolic succession – the priesthood and the Eucharist, whereby they are still joined to us in a very close relationship. Orthodox and Catholics do need a common liturgical approach, so that Orthodox visiting Catholic churches or Catholics visiting Orthodox ones feel they are still living in the same church and are sharing the same approach to liturgy and life. Currently it seems that our approaches to liturgy are very different and largely incompatible. Leggett stressed that baptism is the basis for unity, and that all who are baptized are members of the catholic church. He said he “can’t affirm Petrine supremacy as being of divine origin,” adding that the Roman Catholic Church should not claim to determine the outline of the church. Sr. Donna Geernaert delivered the second keynote address. 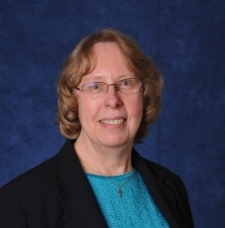 In the afternoon, Sr. Donna Geernaert, SC, Chancellor, Mount Saint Vincent University, Halifax, gave the second keynote address, based on her decades of experience in the ecumenical movement. Geernaert delivered a fascinating overview of ecumenism, stretching back to the early church and reaching around the world. The overall message was positive, especially regarding the Joint Declaration on the Doctrine of Justification signed in 1999 by the Lutheran World Federation and the Catholic Church. She ended with five current challenges: 1) Agreements reached in dialogue “often seem to be of interest to experts only, responding to questions associated with historical and doctrinal controversies far removed from the life of the faithful.” 2) New areas of disagreement have arisen: “use of the trinitarian formula in baptism, questions about who may or may not be ordained, the impact of changing views of anthropology and sexuality on ethical and moral decision-making.” 3) While there is general agreement in the ecumenical movement that unity does not require uniformity, there are differing understandings of what unity in diversity should mean. 4) Painful memories of shared history still require healing. 5) Some prefer interfaith dialogue to the pursuit of ecumenism. Three respondents to Sr. Geernaert pointed out some of the ways in which ecumenical progress is occurring at grassroots level, on the local scene. Christophe Potworowski, reported on very good interactions with faculty and students as he teaches at Redeemer Pacific College, a Catholic institution adjoining the grounds of the evangelical Trinity Western University. He also described his growing friendship with Richard Leggett as the two of them led a series of ecumenical gatherings between Anglican and Catholic parishioners last year. Gillian Hanlon described her years of positive experiences as an Anglican lay person with the Focolare Movement, which promotes unity and universal brotherhood. Though primarily based in the Roman Catholic Church, it has developed many links with other Christian groups. Tom Cooper, founder and president of City in Focus, described several ways in which his group has been instrumental in fostering practical ecumenism. For example, City in Focus hosts the large annual BC Leadership Prayer Breakfast (March 27 this year) and annual retreats in Whistler or other locations so leaders can get to know each other in a quiet setting. They mobilized hundreds of churches and thousands of volunteers under the More Than Gold banner during the 2010 Olympics. And Tom operates as an unofficial ‘chaplain to the city,’ meeting one-on-one with many business and professional leaders. 1. 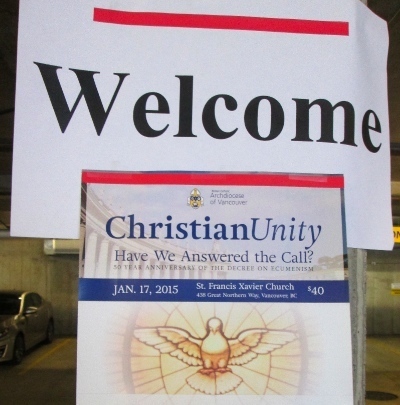 ‘Christian Unity: Have We Answered the Call?’ was a wonderful experience; Marjeta Bobnar and the Diocese of Vancouver deserve much credit for putting it on. The day was a rich one, and I have only scratched the surface in what I have reported. The Roman Catholic Church in Vancouver made a concerted effort to invite people from all parts of the Christian community. Though they are already a major participant in Week of Prayer for Christian Unity events each year, this event signals an increased desire to work with fellow Christians. That’s great news! 2. During a break I wandered over to a display of books for sale at St. Francis Xavier. Among the relatively small selection were Rome Sweet Home and Crossing the Tiber. 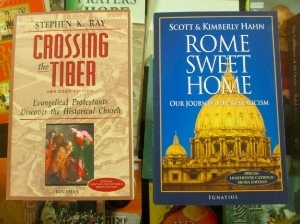 The former tells how Scott and Kimberly Hahn ‘converted’ from Presbyterianism to Catholicism and the latter is full of stories about Protestant ‘converts’ to Catholicism. Apart from the obvious question about what it means to convert if one is already a Christian, I was reminded of another book I came across while preparing for the conference. Prolific Catholic author Ken Whitehead wrote (in 2009) The New Ecumenism: How the Catholic Church After Vatican II Took Over the Leadership of the World Ecumenical Movement. At one point during his keynote address, Fr. Rosica warned his fellow Catholics: “Don’t speak of ‘Coming home to Rome’ or ‘Swimming the Tiber. '” It is hard to imagine how the use of such phrases (and books) can contribute to stronger ecumenical ties between Protestants and Catholics. 3. Nonetheless, the situation at the popular level looks promising. While we may be in something of an ecumenical winter on official and theological fronts (and I take seriously some of the alerts raised during this conference), I see plenty of signs of hope on the ground. Some were mentioned, as ‘concrete examples of practical ecumenism’ and some, unfortunately, were not. For example, there was another ecumenical conference on the very same weekend – Unity Not Uniformity, Diversity Not Division (see the accompanying write-up by Jonathan Bird). At the end of the month Missions Fest will set up at Canada Place – keep in mind Fr. 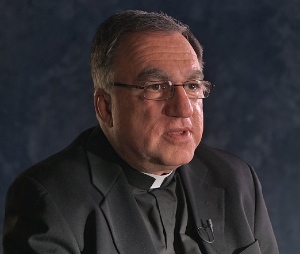 Rosica’s comments about the key role of missions in ecumenism. The Catholics were involved last year, though apparently not this year. It is probably the best of example of practical ecumenism this city has seen, year after year. Voices Together will take place again this year. In 2013, on Canada Day, some 10,000 people joined in worship at Rogers Arena; organizers are expecting more this year, at the Pacific Coliseum. Archbishop Michael Miller joined many other key leaders to address the gathering in 2013, and Catholics are involved again this year. I could go on naming groups and movements that unite the church in various ways – the Westside Christian Leaders Fellowship, the Vancouver East Ministerial Association, the Vancouver Pastors Prayer Fellowship, the Ecumenical Advocates . . .
Just scroll through the Church for Vancouver Events Calendar or the events catalogued in The Light Magazine and you will come across many events which happen day after day, put on by various elements of the Christian community, which welcome the whole community. Many thanks for reporting on this fine event. It is a good step forward for all in the Vancouver area, by owning our shared gospel and progress, while at the same time being honest and open about differences and challenges. The event did that and your summary captures both aspects. Thanks for the terrific support and coverage you’ve given these events and ecumenical efforts, Flyn. You and I have had honest discussions at times about Christianity, conversion, and how we represent our respective faith communities, while working ecumenically together. I don’t have the perfect formula for maintaining a healthy and productive tension among these elements, but with the Holy Spirit and such efforts as these I look forward to seeing what God achieves as we strive to be one, just as Jesus and the Father are one. Thanks Paul. Fortunately for both of us, we are both part of God’s one church and he knows how things will work out, even if we don’t. We can trust in God’s goodness.